The joint where the floor meets the wall is called the cove. When a foundation is built, the footers, floor and walls are all built separately. Expansion and contraction of these structures creates a void or entry point for water to seep in. When underground water is under pressure, it is referred to as hydrostatic pressure. 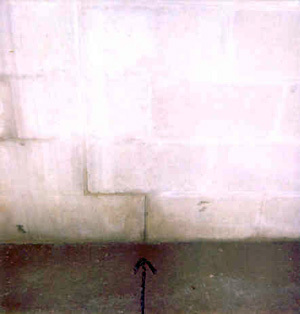 This hydrostatic pressure can force water in through the cove area, through wall cracks and even up through floor cracks. Builders usually install footer drains, drain tile or french drains to try and prevent this problem from occurring. Unfortunately, these types of drainage systems often end up clogged when ground water picks up sediment and mud as it travels through the soil. Install a drainage system – replacing your outside drain tile can be expensive and may not give you long lasting results. The soil conditions that caused the original drains to clog, will probably cause your new drain tiles to fail. If you have clogged french drains inside your basement, they can be easily removed and replaced with a new drainage system. A dependable drainage system can relieve water pressure underneath your basement floors and alongside your footers. By relieving this hydrostatic pressure, you’re removing a lot of the problem source. Many areas prohibit connecting these type drains into the sewage system so you’ll probably need a sump pump installed to remove the water they collect. Basement Wall Cracks, and Form Tie Leaks - When the soil directly against the foundation get wet and saturated, water will be forced in through and voids in the walls like cracks and rusted out form tie pins. 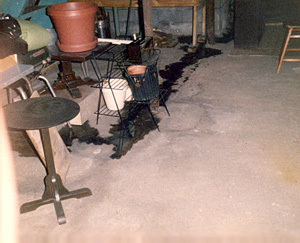 Remedies for Leaky Cracks - There is a host of basement sealer products available at home improvement stores. One thing to remember though; if you seal a leak from inside the basement, there is still water inside the wall, behind your patch, waiting to dissolve the water soluble ingredients away from the cement, causing the repair to eventually break loose. If a form tie leak or wall crack is not too far underground, it is conceivable to dig out the area from the outside and apply an elastomeric waterproof sealer over the problem area. An elastomeric material will stretch as the foundation expands and contracts. Another option is to inject a waterproofing substance directly through the basement wall cracks from inside the basement. Some materials injected will expand greatly as they come into contact with the ground water, making the seal even better. Some contractors have a wall crack repair system which consists of installing rigid wall panels, made out of a waterproofing polymer, over the cracks to a point below floor leave. This type repair requires removing a small area of the concrete floor, along the areas to be waterproofed. An interior drainage system is installed along the footer to collect and leakage diverted down by the waterproof panels. The basement floor would then be re-cemented to its previous condition. A benefit to this approach is that you are helping to relieve the hydrostatic pressure which is responsible for most basement leakage problems. Carefully read any warranty offered with these type repairs to see, how long is the repair warranted, what is covered by the installer’s warranty, what’s not going to be covered and for how long the warranty lasts.